The disagreement between Anyone and Everyone is the rock that will sink David Cameron’s Big Society project, and all similar ideas. All known humans exist within a social group. Almost all individuals regard exclusion from their chosen group as one of the worst possibly penalties. But each individual will also be aware of themselves as a person distinct from the collective, not identical to the pseudo-individual known as ‘Everyone’. ‘Everyone’ is defined by the group, an average of the individual members. But anyone within a group is able to wonder if they are being cheated or deceived. Even be able to think about shifting from one sort of ‘Everyone’ to another. On practical matters, almost everyone likes the idea of necessary social tasks being done by volunteers. But how many will change their own life-style to make it possible? Voluntary work used to depend on a large stratum of people who had no need for paid employment, some of whom saw paid employment as something that would lower their status. This used to be true of middle-class women, outside of a few selected occupations like nursing. It was also true of the gentry. But it isn’t true of anyone any more. What mostly happens is that ‘voluntary work’ gets taken over by people who make a living out of it. There are still a few enthusiasts, but less and less. This was an unwanted side-effect of a pair of very necessary advances that the left successfully imposed – paid employment for women to be considered normal, and class distinctions to ceased to be viewed as meaningful. The most sensible reaction would have been to treat this as a ‘problem of success’ and insist that the least bad solution is to have government funding. But most of the left and especially the liberal-left never entirely lost the notion that it should all happen spontaneously. They might fight hard for state funding for people close to them or issues dear to them. But outside of their own immediate concerns, they’d go along with a general sneering at the role of the state. This was something that the New Right were able to exploit. But before one gets too depressed, remember that the New Right have nailed their colours to the mast on a promise that they can’t meet. They’ve not reduced the size of the state machine, nor made it easier for individuals to live as they wish. They’ve replaced well-intentioned state directives with blind market forces that have left a great many people in a range of individual financial traps. Rather than the small business person flourishing, most of them have gone out of business and the current recession will finish a lot more. A small number of small business persons get very rich from small beginnings. But it’s much harder than it was in the 1980s to have a stable self-employed existence. The big social changes that occurred during the period of New Right dominance have been things that the New Right were always lukewarm about, or kept silent about at key moments. The cluster of ideas linked together as ‘Green’ have grown from fringe politics to a major political force, with most existing parties borrowing to their ideas and new Green parties becoming electorally significant in several countries. Meantime conventional bourgeois morality is still sometimes preached, but seldom practiced. In the 1970s, it was distinctly daring for a man and a woman to be living together without being married. These days almost everyone has a period of living together before marriage, if they get married at all. Homosexuality was no longer criminal in Western Europe – it still is in parts of the USA – but not many in the 1970s would have accepted it as a normal life-style. It was mostly the liberal-left who kept annoying the more traditionally-minded supporters of Centre-Left parties with a demand for normalisation. Only after the fight was substantially won did the New Right come forward and take the ‘Virtually Heroic’ position of declaring it ‘Virtually Normal’. Likewise there was no theoretical barrier to women having top jobs by the 1970s, but not many got those jobs. Thatcher herself fitted the long-standing pattern of having a woman to front for you when you’re carrying through mean, uncaring and unscrupulous policies. She remained pretty much the only important woman in her various governments. Progress occurred elsewhere and amidst sneers about ‘politically correct’. Sneers that didn’t add up to a coherent policy: only on matters of tax and the role of government was their a serious effort to restore 19th century norms. Old-fashioned morality in general has withered: right-wingers show a vague nostalgia for it but do not let their individual wishes be thwarted by it. They may agree it would be ‘good for everyone’, but when it comes to making personal sacrifices for their proclaimed beliefs, hardly anyone will do so. Everyone likes to see themselves as a special case. That’s not to say we’re not in a mess, we are. But it’s not because of any inherent brilliance of the New Right. More because left ideology failed to move on from methods that had been very successful, but were no longer applicable. Yet the New Right had nothing except a desire to return to 19th century values of a small state and a weak working class. They say ‘radical’, but their economic policies are reactionary in the strict sense of the term, a desire to return to a past order. In a fast-changing world, the New Right have had power but not authority. Their grand principle has been laissez-fair, which might be translated as let it be, or even let things drift. Such a policy relieves you of the unpleasant burden and expense of trying to keep control. It lets you preen yourself on your commitment to Freedom and Individual Enterprise. The drawback is that when you ‘let things be’ in a society that is seething with changes and new demands, what you let be is not at all what you were after. The New Right’s main success has been restoring the profit motive, the sanctity of ‘Rational Economics’. It is declared that immediate commercial profit is the only trustworthy guide to general human welfare. For economics – though not for other matters – they insist that only self-interest can be taken into account. Neither sympathetic sentiments nor a concern for long-term human welfare should be considered. Real people don’t work like that. The dominance of ‘Rational Economics’ is associated with widespread discontent and unhappiness, and also with outbreaks of ‘irrational’ behaviour. Actual human behaviour is based on a complex mix of motivations. Self-interest plays a role, but often it is wildly mis-calculated. Or people get carried away by immediate gratification and do themselves long-term harm. Alcoholism, drug abuse, gambling, there are a whole range of behaviours that people get hooked on. Unsurprisingly, all of them are heavily developed in the USA, where there is much less in the way of tradition to get in the way of the juggernaut of under-regulated economic forces. Actual human behaviour includes self-interest, calculated or mis-calculated. But it also includes large elements of sympathy, and also notions of duty of various sort. If you look at the books that business managers read in order to learn how do their own job effectively, you find that the famous ‘management gurus’ are taking an outlook that flatly contradicts ‘Rational Economics’. Within a company or corporation, the management try to build up a suitable ‘group-think’, assuming that people are motivated feelings of loyalty and duty as well as cold cash. Wherever possible, management will also manipulate feelings of sympathy, by claiming and perhaps believing that their particular corporation is particularly good at meeting the needs of the needy. When Adam Smith was writing, ties were broadly personal. Each firm belonged to one man, or sometimes two or three. It was all personal, a form that has vanished over the years as competition got fiercer. Resentment at big impersonal corporations fed into New Right politics – but if they ever intended to do anything about it, they failed. Almost everything is bigger and more remote than it was in the 1970s. When the central idea is ‘all power to the money’, nothing else is likely. That was Karl Marx’s key insight – that the new capitalist society was self-destructive. Collectively the rich and powerful might like the existing order. Individually they would usually let the profit motive persuade them to undermine the little bit of the existing order that was closest to them. That’s just part of the general conflict between Everyone and Anyone, the need to make each individual conform to rules seen as necessary for everyone’s welfare. Economic Liberalism denies that this is a problem and Economic Liberalism is flatly wrong. Marx underestimated the ability of society to mutate without becoming socialist. He never supposed that the West could strengthen capitalism yet also free itself of the social values of the European bourgeois, which is what has happened. But whatever new form gets created will immediately start undermining itself. What’s the alternative? The New Right and similar thinkers often rely on verbal trickery, especially when the are supposed to be Christians. Europe’s Christian Democrats were more or less sincere in their Christianity and so kept markets in check. This produced spectacular economic growth in Italy and West Germany between the late 1940s and mid-1970s. Similar systems also worked very well in Japan and in France under De Gaulle. Rather than claim this as a partial success, most socialists preferred to denounce it as capitalism and ignore what had been achieved. This and a neurotic fear of ‘corporatism’ laid the ground for the triumph of the New Right and the ideology of ‘All Power to the Money’. This is actually not true: in the days when most shops had a single owner or a small partnership, there was some sort of social relationship between the shopkeepers and most customers. This could be more important than price – some shops gave social prestige, a pattern that has nowadays almost vanished. No sensible person expects benevolence from a supermarket. And I’ve never come across anyone who views supermarkets with affection, as distinct from finding them quick and convenient. People did like old-fashioned shops, just not enough to keep them in being. Thatcher the grocer’s daughter help up the principle of ‘all power to the money’, not realising that this ensured that a new generation of people like her would not flourish in the new order she was creating. Critics of benevolence point out that it is mostly not absolute, which is indeed true. Everyone might be better off if everyone liked everyone else about equally and all equal to themselves – or perhaps not, but in any case it is not likely to happen. But people do feel other people’s pains and pleasures to some degree, the more strongly when there is a strong connection. Profit and loss are expressed in numbers, and so resemble the maths that work very effectively in many areas of science. But you could do exactly the same with sympathy. For instance a man called Fred might count his brother’s ‘units of happiness’ as worth 70% of his own, those of his cousins at 50%, those of his helpful and agreeable neighbour Tim at 60%, the needs of a stranger as 20% as valuable as his own. It might also be that Fred cares a lot about his son and actually rates his son’s ‘units of happiness’ as worth 150%. Fred might also hate a neighbour called Pete, and so will go out of his way to cause harm for Pete, within limits. To formalise it, maybe he’d sacrifice one unit of his own happiness to gift Pete with five units of unhappiness. I suspect that using computer software, you could fabricate something like human behaviour from this, people who were neither wholly selfish or wholly generous. You’d find, I suspect, that very different patterns of behaviour emerged, depending on the strength or weakness of ties. Feelings of sympathy are necessary – but so are feelings of duty. If no one lied, stole or used violence for selfish ends, then everyone is better off. Yet any one person might gain if they did these things occasionally, when there was a large gain and a small risk of being caught. This is another ‘disagreement between Anyone and Everyone’. Traditional culture tries to protect against such things, but imperfectly. People thrown together into a vast impersonal state are much less controlled by traditional culture, which is probably why state machines were organised and were accepted. Everyone can see that rules are necessary, but that’s not to say they want to take the trouble and run the risk of enforcing them. Everyone is better off if the task is undertaken by someone strong, or else by a regular body of people who get paid for it. The idea of a ‘knight-errant’ or superhero avenging wrongs is a popular one, and also a very unrealistic one. The most famous of them, Robin Hood, is actually a much nastier and less admirable character in his first known appearance, a compilation called ‘A Gest of Robyn Hode’. His initial mission is to help a knight – a privileged individual. [A] The knight is in debt because his son killed two men in a joust and he had to pay compensation. Robin Hood helps him, and later gets the money back by robbing the monks to whom the debt was owed. Nothing is said about helping the poor – in mediaeval times, monks were much more likely to do that than anyone else. Unsurprisingly, this little tale has never featured in any of the flattering dramatisations of the outlaw-hero. 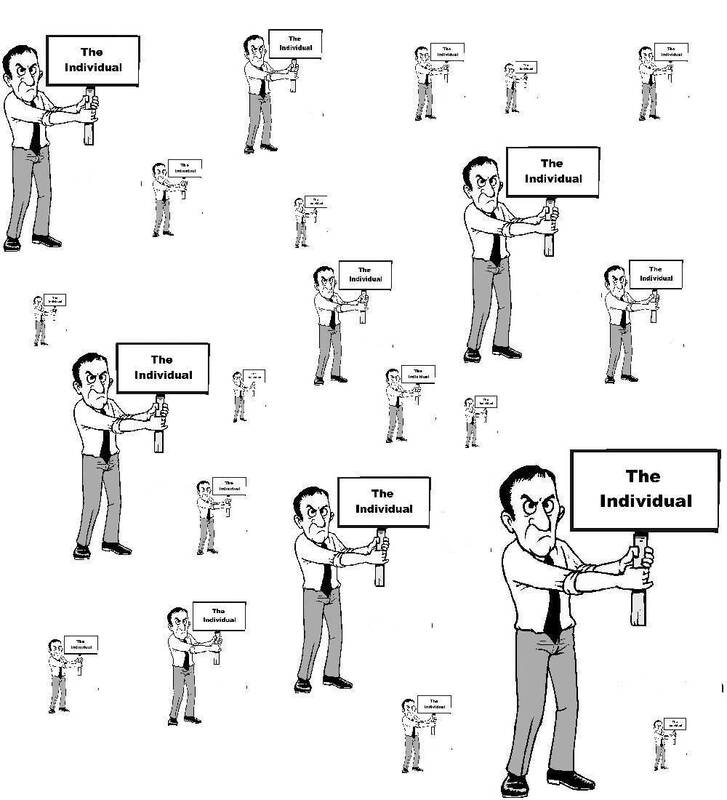 Another alternative would be for each individual to have almost exactly the same thing, so that ‘Anyone’ is never very different from ‘Everyone’. That’s how a tribe manages it, though even a tribe will need some sort of central authority if it gets too large or starts to rule other tribes. The anarchist ‘solution’ is that everyone should behave like a tribalist in as far as they like tribalism, but not in as far as they dislike it. I can’t see this makes any sense. Anarchism as a political creed tends to flourish where the state is mild, autocratic and in need of drastic change. When actual anarchy occurs, when random political disorder becomes the norm, ideological anarchism withers and authoritarian creeds replace it, as happened across much of Europe after World War One. Most individual anarchists get marginalised, a few get killed, a few become part of the New Order. To actually improve the world, what’s needed is the unromantic alternative, the system that actually works. A state machine that can enforce the views of ‘Everyone’, however ‘Everyone’ may choose to define it. If the state is efficient – and if you personally agree with the crowd of ‘Everyone’ that you find yourself among – then the ‘disagreement between Anyone and Everyone’ can be resolved as sensibly as is humanly feasible. First published in Problems of Socialism and Capitalism in 2011.